the sweetest thing...: Dream BIG - MOJO Monday's 300th! Good morning!! It's a HUGE day for Mojo Monday - This week Mojo Monday is celebrating its 300th sketch by offering 30 prizes for participants! Play along with the Mojo Monday 300 sketch and link it up to the Mojo Monday linky entry form and you’ll be in the drawing for some fabulous papercrafting goodies! For all the details, a list of prizes from over 20 different companies and some fabulous samples using the Mojo 300 sketch head on over to the Mojo Monday blog. Verve will be having a special discount during the celebration! Enter gift code 300MOJO to save 20% off your order at Verve Stamps. 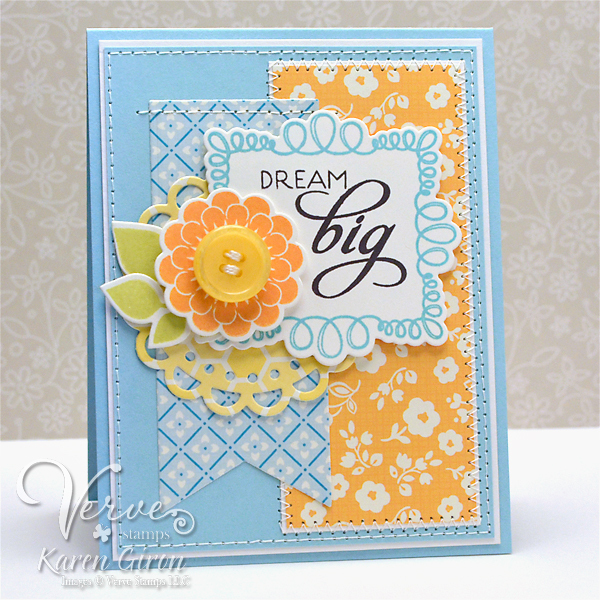 For my celebration card, I used Dream Big and On Occasion stamps from Verve. I started by cutting the Occasion Frame Die out in Smooth White card stock and then stamped the looped frame in Blu Raspberry ink. I cut out some Dreamy Leaves and Scalloped Flowers and added a Lemon Drop button over the center. The patterned papers are from the Country Drive 6x6 pack by Echo Park. Be sure to stop on over to the Mojo Monday 300th Sketch blog post and check out all the details. This is one challenge you don't want to miss out on! LOVE Orange Fizz flowers!!!! Such a cute card!!!! Stunning, as always, Karen! Love how you switched up the sketch to accommodate your sentiment shape better. I may not comment (or play along with your Sweet Sunday Sketch) very often, but I am always drawing inspiration from you. Super gorgeous card! I LOVE the colors and stitching detail. Super Cute! Love all the patterns and the stitching! Absolutely luscious! These colors are so great together and for some reason make me think of ice cream or maybe sherbet? Very pretty. 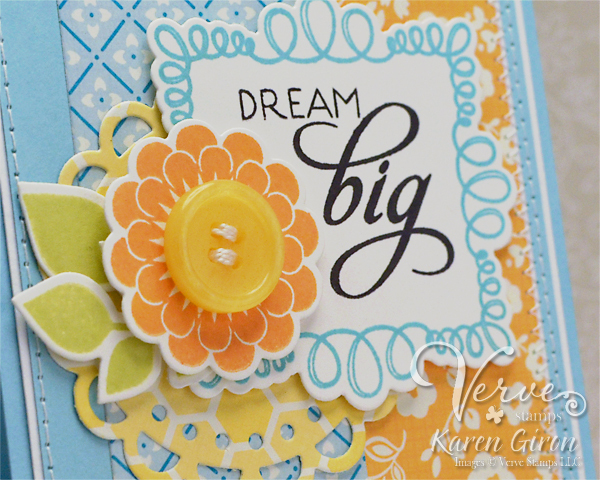 Very pretty card, love the cheery colors & patterns! Pretty card and wonderful mixture of DP. I really like this project; thanks for the inspiration.